Lacquer or Leave Her! : October PPU: It Girl Nail Art Limited Edition LE105! October PPU: It Girl Nail Art Limited Edition LE105! Today I have another PPU goody to show you: a limited-edition stamping plate from It Girl Nail Art celebrating all things villain! That's right, you have your Dr. Who villains, your Star Wars villains, Transformer, Mario Bros, Maleficent, Harry Potter, and oh yes--Batman villains. So much fun to be had, and so little time. I started with a base of Sally Hansen Get Mod, and then I sponged Messy Mansion Red-y Or Not and Amalfi Coast to capture the look of Harley's ponytails. Then I stamped the diamond images with those colors and Chalk. Then I stamped the final image with Carbon. For this one, I started with a base of Sally Hansen Get Mod and Blacky O, then I stamped the blood images with Girly Bits Silver Bells and Fire-Engine Red with a texture image from It Girl Nail Art IG123. 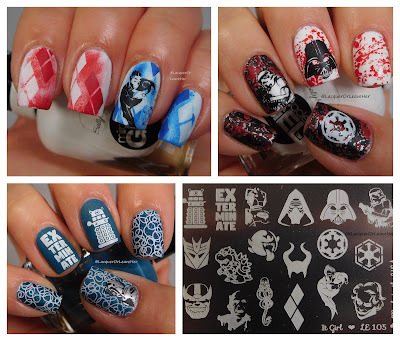 Then I stamped my villain images with Girly Bits Little Black Dress, White Wedding, and Silver Bells. For this one, I used Stella Chroma Perseids to look like outer space, and Stella Chroma Flannel & Boots to look like a tardis. Then I stamped my texture image from It Girl Nail Art IG123, and then my villain images with Girly Bits Silver Bells, White Wedding, and Little Black Dress.